While India has been struggling with double digit Inflation for past 3-4 years, it still boasts some of the cheapest cities in the world. Within India, Mumbai & Delhi are some of the most expensive cities to reside in, primarily due to the sky-high real estate prices that these cities command. However, when compared to other cities globaly, they still rank among the most inexpensive cities in the world. According to the Economist Intelligence Unit’s, Worldwide Cost of Living 2012 survey – Mumbai ranked 2nd cheapest city in the world just above Karachi. New Delhi was ranked 4th least expensive city in the world. Unbelievable as it might be, this is true – The cost of living in even most expensive Indian cities is less compared to many other major cities in the world. According to the EIU’s survey three of the four cheapest locations hail from the Indian subcontinent, highlighting the reason why India is still an attractive destination for labour outsourcing, relocation and Foreign Direct Investments. On the other hand Japanese and Swiss cities are most expensive in the world, with Zurich coming at top followed by Tokyo, Geneva and Osaka. It is interesting to note that not a single city from Asian sub-continent features in the top 10 most expensive cities. Personally for me it is still hard to believe that Mumbai is one of the cheapest cities in the world. I think there are couple of reasons why these ranking may be skewed – I doubt that EIU’s rankings take into consideration the average earnings of people. And secondly, the rankings seem to be only based on commodity pricing. I am not sure whether real estate pricing is taken into consideration, because if that was the case – Mumbai boasts some of the most expensive real estate pricing in the world. 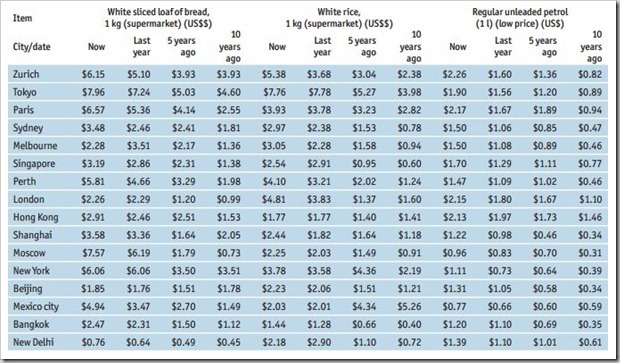 If you see the above chart, it will show you the pricing of essential commodities like Bread, White Rice and Petrol. Delhi does boast some of the cheapest prices, however, if you compare it with earning power of people, the prices will give a proper perspective. Really a nicely compiled data! If Delhi and Mumbai are among the cheapest cities then it can be understood that how the prices are up in other part of the world.Being an Indian resident, I still feel that Mumbai and Delhi are reasonable cities where we can afford all the facilities.